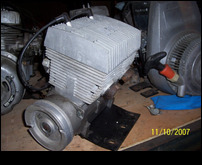 Wanted Rockwell JLO Free Air engine or parts. Two cylinder 440, three cylinder 650 or four cylinder 800. Made for the 1971 racing season. Sorry, I do not yet have any FA engine parts. May be interested in what you have though. What machines used these engines? I dont think I have ever seen one before. 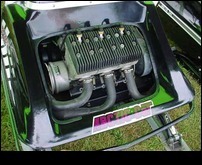 For some reason in 1971 Artic Cat did not have a 650 Kawasaki engine for the King Kat so they used the 650 3cyl. Rockwell JLO Free Air. Other than that I have only seem em (out of snowmobiles) sitting on a dealers shelf. 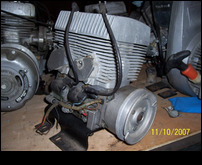 Saw a 4 cylinder 800cc for sale at Wyatts Sport center in the 1970's (sitting on a shelf for sale). I don't think they were a very good engine. I have a complete 440 in running cond. that i picked up a few years ago. What I have found is they built enough stuff for 50 of the 440's and put 42 together. They were then sent out to the differant sled companies for testing, Speedway got most of them. they had good results with a fuel injection set up on them. Jlo decided to end the project of building a race twin and told the companies to do what they wanted with the engines. The 440 was never sold to the public or put in a sled to sell, testing and develpment only. I have seen one other 440 and some 4 cylinder ones but never in a sled. What are you thinking of doing with one if you can find it. I really only need the cylinders and heads. I would like them for a Free Air Scorpion Whip. and will make a three cylinder FA JLO sometime in the future. I am going to reproduce the cylinder heads. My machinest will copy them with a CNC milling machine. I will probably machine the shroud off of some fan cooled Cuyuna cylinders. It would be nice to have the original JLO FA cylinders and heads to show my machinest (so he knows exactly what I want). If you have any parts I would like to buy them. They don't really even need to be useable as long as they can be copied by my machinest for his CNC. If I can do this at a reasonable price I will produce a small quantity and sell them to Scorpion fanatics. I have an 800cc jlo for ya. Is been sitting in my shed for over 15 years and it will still run perfectly if you just put a little elbow grease on it. And around 16 other 1970s artic cats just sitting waiting for the right person to buy them from me..... just saying.